In the first part of 2018, the Commission reviewed the information on the websites of the educational institutions. The report is available on the website of the Code of Conduct. Last year, following two Commission reports on the provision of information about courses and the accreditation of the study programmes, the umbrella organisations (NRTO, VH and VSNU) agreed that the Commission would carry out an annual review of the websites of selected educational institutions. With these examinations, the Commission wishes to contribute to the correct provision of information to international students. The websites of the institutions are the first – and easily accessible – information channel available to an international student in his or her home country. The Commission has examined the websites of six institutions: Hanze University of Applied Sciences, The Hague University of Applied Sciences, University of Amsterdam, Utrecht University, Webster University and KIT Royal Tropical Institute. In addition to examining the provision of information about the courses and the accreditation of the study programmes, the Commission reviewed information about housing options and whether the institutions correctly identify themselves in their nomenclature with regard to the distinction between universities and universities of applied sciences. Finally, it was checked whether the websites of these institutions contained information about the Code of Conduct and the complaints procedure for international students which is included in the Code of Conduct. 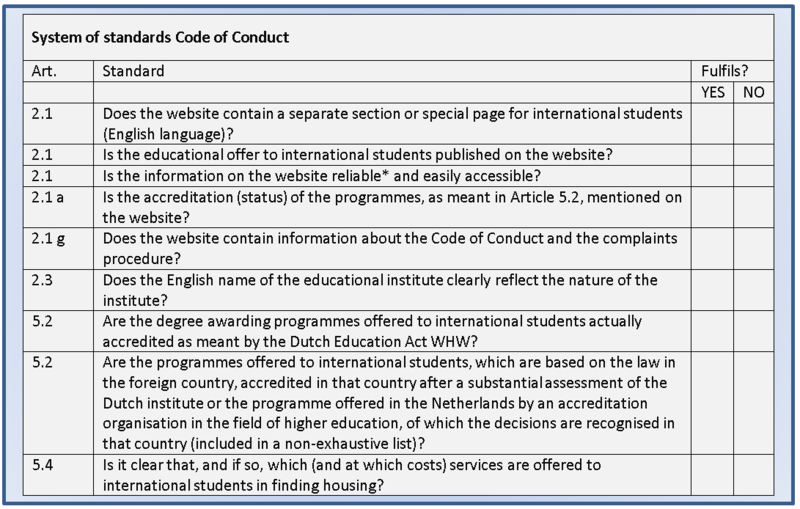 The Commission converted the above themes into a system of standards in which the articles of the Code of Conduct were translated into closed questions (see below). The educational offerings of the institutions were generally presented in a clear manner on their websites. The offer was easy to find and the information came across as reliable. Some institutions also stated its CROHO number, which makes it easier to check for accreditation. The selected institutions clearly communicated in their names the character of the institution – university or university of applied sciences. In general terms, the information about housing was what could be expected. Valuable information was that some institutions warned students of the difficulties in finding a room. As far as the Commission is concerned, that should always be included in the information given. The Commission believes that it is very important for students to be aware of the risks and that they should start searching for accommodation well in advance. For many of the institutions, the information about the Code of Conduct did not comply with the standard. Not only was the (current) text of the Code of Conduct often lacking, many sites contained outdated information, links and brochures. It was striking that in this regard information was often lacking about the complaints procedure for international students as is included in the Code of Conduct. That is why the Commission would like to make an urgent request to verify this information. The findings were presented to the relevant institutions. The Commission appreciates the positive reactions of the institutions. Most of the findings were quickly addressed and led to changes to the information on the websites. The Commission would like to draw attention to the need for careful information on the study programmes. It is important that it is clear to a (international) student what the offer contains and that the information is presented unambiguously. The Commission considers it important that the information provided to Studyfinder corresponds with the information on the institutions own website. This makes searching easier for the student and prevents confusion. This applies in particular to the naming of study programmes, but also to the number of study programmes that are presented. The Commission calls on the institutions to reduce disparities and to actively harmonise the nomenclature of their study programmes. Finally, at the beginning of 2019, the Commission will carry out a similar review of the information on the websites of six selected institutions. Any issues that may be current at the time can, if desired, be included in the review, just as accommodation was included in the information review. If you would like to know whether your educational institution meets the requirements regarding the provision of information, match your website with the system of standards.